We all want to live in a safer, more secure world. But earthquakes and hurricanes, floods, transportation and domestic accidents, epidemics and industrial disasters still account for many thousands of deaths and injuries each year, in addition to material and social damage. International Standards offer widely accepted and recognized solutions to prevent and respond to these threats. The role that standards can play in preventing or mitigating such human and material losses is increasingly recognized and their use is rising as a consequence. 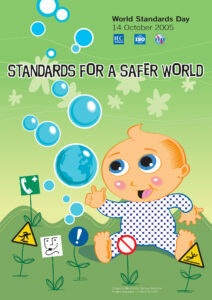 “Standards for a Safer World” is the theme of this year’s Worlds Standards Day to be celebrated on 14 October 2005. The International Standards produced by the world’s leading international standards-setting organizations – International Electrotechnical Commission, the International Organization for Standardization and the International Telecommunication Union – provide a valuable safety net. The three organizations’ procedures and areas of expertise ensure that the world’s leading experts from industry, government, academia and society work together to develop International Standards that contribute to building a safer, more secure world. Their International Standards are thus based on a double level of consensus: amongst stakeholders and across countries. Cybersecurity and protection of the integrity of fixed and mobile communication networks. IEC, ISO and ITU standards developed at the international level are available for use at the national and regional levels to meet societal, market and regulatory needs. They assist in disseminating best practices and new technologies, while avoiding new barriers to trade that national security and safety regulations may create. For those technologies involving electricity, electronics and related technologies, the IEC produces both product-specific standards (for example, for electrical batteries or laptop computers) and system standards (for example, functional electrical safety in a factory system. Product standards enable goods to be certified to internationally recognized safety standards. Typical hazard abatement measures include protection against electric shock, excessive temperatures and fire, ensuring that equipment does not have sharp edges or moving parts, and protection against the effects of electromagnetic emissions on the human body. Just a few of the many fields where ISO International Standards ensure safety include construction, transportation, safety in the home or at the workplace. From safety in buildings, including emergency, fire and alarm systems, to standards that help to protect car drivers and passengers (such as child restraint systems, anti-locking braking systems and airbags), to various aspects of food safety and quality (including a new food safety management system), to machinery safety standards, ISO standards help make the world a safer place. For its part, ITU is taking a leading role in the area of cybersecurity, developing standards that will help to combat cyber crime, including protection against identity theft. In the non-cyber world, ITU is working on standards that will allow the prioritization of calls in a disaster situation. This means that in an emergency, telecommunications networks can be effectively cleared of non-urgent calls. The new phenomenon of telemedicine, whereby doctors and surgeons located in different facilities can communicate and administer treatment remotely, is also possible thanks to ITU’s real-time multimedia standard. Implementation of IEC, ISO and ITU International Standards at the national and/or regional level are helping make the world a safer place. The standards currently under development by the three organizations address the new safety and security challenges of the 21 st century. Together, the IEC, ISO and ITU are working to produce the “Standards for a Safer World”.